You are currently browsing the tag archive for the ‘riverbank erosion’ tag. This beautiful tree was at risk because of severe erosion of the riverbank facing the Alexandria Canal. Thick roots well below ground level were exposed. Many had turned themselves inwards away from the brackish water. It was only a matter of time before this tree succumbed to the salt water & died. I feel confident that this beautiful tree will survive now because Sydney Water is reconstructing the riverbank in this location, adding at least 2-metres width of eroded soil to the riverbank. 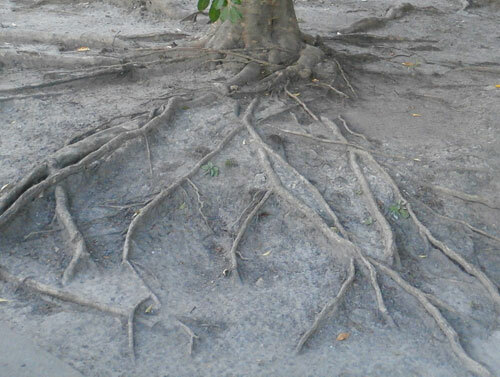 I don’t know why, but they cut the roots instead of just burying them when they fill in with soil. 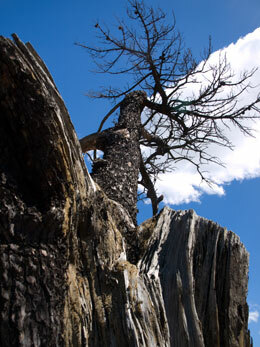 Regardless, I am pretty sure that this tree will manage & feel much better not being exposed to salty water. It appears Sydney Water is doing remediation works to the riverbank all the way to the pedestrian bridge at the edge of Tempe Reserve. I think this is wonderful & thank Sydney Water. Tree roots have been chopped off. The photo shows how significant the ersoion had become. It is excellent that the riverbank is being repaired here. I remember the shock & disbelief I felt when I first heard years ago that the Earth was running out of topsoil. How could this be so? But it is happening. Scientists believe the planet loses about 1% of topsoil per year to erosion & it’s not easy to replace, taking hundreds of years to restore just 2.5-5cms (1-2 inches). American Actor Eddie Albert said the following in 1980 – “When our European ancestors arrived on this continent, our topsoil averaged around 18 inches [45.7cm] in depth. With our intensive agricultural practices, we’ve eroded it to around eight inches [20 cm]) . . . that’s all that’s left between us & world disaster. When that eight inches goes, you & I go. When the trees were gone, topsoil loss inevitably followed. Exposed to rain, wind, & sun, it lost its organic matter, its humus, its soil life . . . the spongy quality that gives the earth its ability to hold water through droughts. . The soil dried out & became dead dust. The next wind blew it away, or the next rain washed it down the river . . . & the earth died. The climate changed as the rain cycle slowed down as a result of deforestation. Because trees are so important in preventing topsoil loss we should be getting as many into the ground as we can. 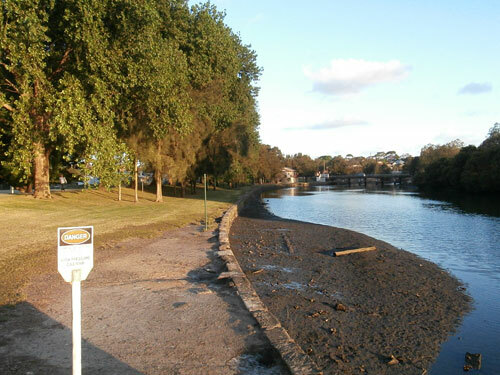 Along Marrickville’s side of the Cooks River at Kendrick Park, Mackey Park, some areas on the way to Steel Park & along the Marrickville Golf Course show erosion of soil. When there is a big tide, these areas flood & take soil into the river when the tide goes out. There are significant holes where soil has been removed from the riverbank even where there are sandstone walls. 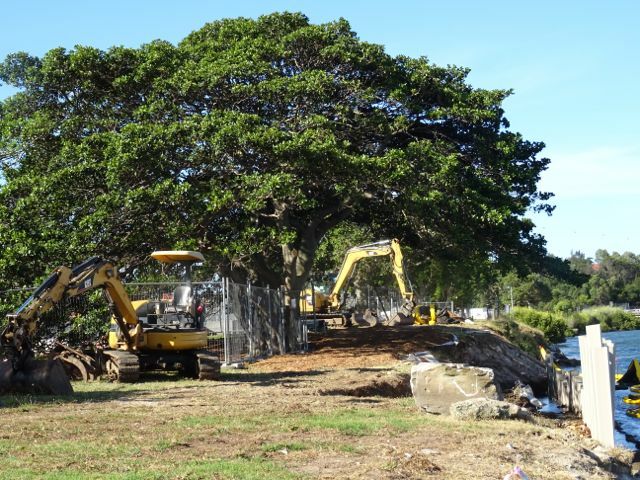 Marrickville Council will be planting trees along the riverbank of the golf course with a budget of $30,000, which should make a difference in this section. The Ecological Agriculture Australia Association has published a Special Edition online newsletter for World Soils Day packed with articles & links concerning soil. It’s quite an incredible resource. Thank you to my friend who sent this to me this morning. See – http://bit.ly/VkMT6F We can all do something to improve soil. It’s too important to ignore. The area at Mackey Park without grass often floods when the tide is high & is full of holes. It gets worse every year. 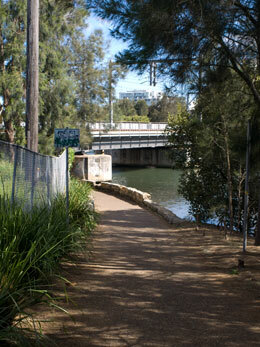 Marrickville Council is currently doing restoration work on the Cooks River bank in Kendrick Park Tempe. This is the lovely park on the opposite side of Tempe Reserve & right next to the Prices Highway. 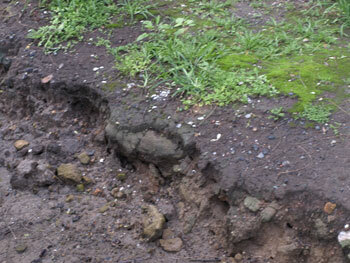 The riverbank has been experiencing erosion. Council has placed many sandstone blocks along the bank with felt matting to stop the soil from washing into the river. I presume this will stabilize the area & allow the mangroves in the area to take root & establish naturally. The space between the stones provides space for river creatures to live. One very old pine tree near the bank has died so I assume this will be removed soon. The works look great & it appears that some areas will be set up as steps to allow one to sit on the bank to watch the river go by. 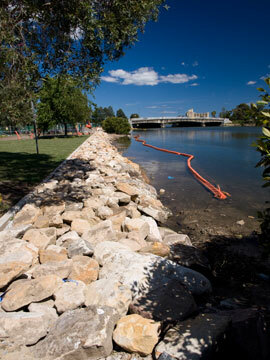 The work seems to match what has been done on the opposite bank near the Wolli Creek development. 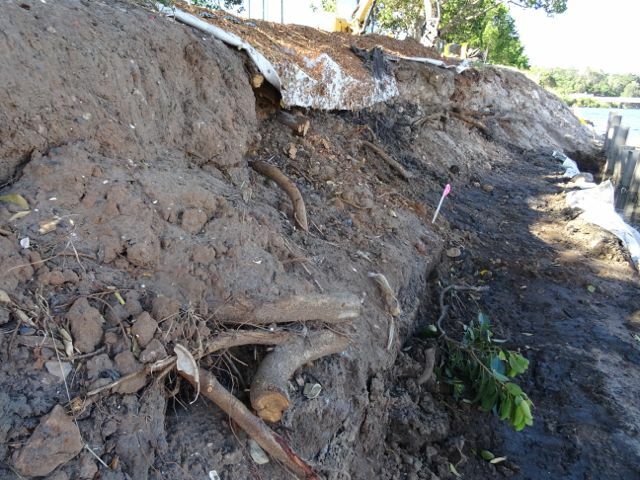 Bank restoration work like this has been done with great success around Tempe Reserve. lots of different species of trees & two massive Hills Figs closer to the highway. It was a hot afternoon, but the temperature was much, much cooler under the Fig trees. If you like Fig trees, they are worth a visit as they have been allowed to grow naturally & have an expansive canopy. There is also a Mulberry tree near the riverbank for those who like fruit trees in public spaces. It is full of fruit that should be ripe for picking in a few weeks. One of my fond memories of being a child was summer eating of Mulberries direct from the tree. Take you kids there & let them get purple fingers & black tongues. The park is below a sandstone cliff face. Lots of trees are growing here as well giving the area a bush feel rather than a landscaped urban park. The Cooks River cycleway travels past Mackey Park, follows the river past Tempe Railway Station then through this park before crossing the Princes Highway to Tempe Reserve. It’s a surprisingly picturesque walk as there has been lots of bush regeneration. There was a cycle day happening last weekend. People were cycling from the Olympic Stadium to Tempe Reserve, then back again. At least 100 or so cyclists rode past while we were there. The cycleway is brilliant for bike riders. 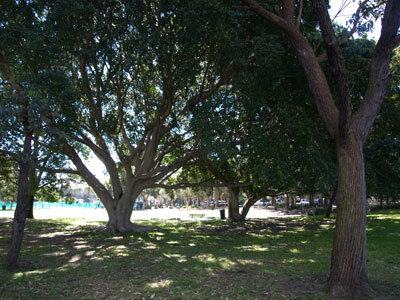 Kendrick Park is yet another lovely park along the Cooks River. I don’t remember play equipment, but kids were riding bikes & tricycles along the many paths while we were there. It’s worth a visit & the restoration work along the bank only enhances the beauty of this park.